*Army detains Finance Minister as 'criminals' rounded up Zimbabwe's military says it has seized power to target "criminals" around President Robert Mugabe, who it said is "safe and sound" in custody with his wife. The army said it was securing government offices and patrolling the capital's streets, after a night of unrest which included a military takeover of the state broadcaster. The action triggered speculation of a coup, but the military's supporters praised it as a "bloodless correction". Grace Mugabe, the wife of Zimbabwe's president has reportedly left the country for neighbouring Namibia. Her husband Robert Mugabe is thought to be under house arrest in the southern African country's capital, Harare. It is unclear how Ms Mugabe was able to make her escape. The European Union has called for dialogue in Zimbabwe and a peaceful resolution to the crisis. "The recent political developments in Zimbabwe, and their spillover, including in relation to the country's security forces, are a matter of concern," said a spokesman for the European Commission, the EU executive. "We are following the situation closely and we want to underline that the fundamental rights of all citizens need to be respected and the constitutional order and democratic governance needs to be upheld," he added in a statement. "We call on all relevant players to move from confrontation to dialogue with the aim to a peaceful crisis resolution." President Robert Mugabe should be removed as the country's leader, the secretary-general of Zimbabwe's War Veterans Association has said. Victor Matemadanda said the military takeover was for the good of Zimbabwe. The British embassy in Harare has said it is following the developments very closely. Simon Thomas, acting ambassador, confirmed the military are deployed at strategic locations around Harare. "It's very fluid and it's hard to say exactly how this will turn out," Mr Johnson said. "The most important point to make is that everybody wants to see a stable and successful Zimbabwe and I think we are really appealing for everybody to refrain from violence." Boris Johnson has said it is important everyone refrains from violence in Zimbabwe. The foreign secretary said the situation is very fluid and it is hard to say how it will turn out. He's monitoring the situation, as Britain wants to see a stable and successful Zimbabwe. Mr Zuma said he spoke to President Mugabe earlier this morning, who indicated he was confined to his home but said he was fine. South Africa's President, Jacbo Zuma, is sending a special envoy to Zimbabwe to meet with President Robert Mugabe and the Zimbabwean army, Reuters reports. Mr Zuma is doing this in his capacity as chair of the Southern African Development Community. "They are now in charge of all armoury, all gates and roads leading in or out of the camp. Arcturus Road [which leads to the camp] is closed and all Support Unit details with guns have been disarmed," the source said. Robert Mugabe's legacy as one of the most ruthless tyrants of modern times will remain long after his days as notorious statesman of Zimbabwe are over. A representative for Zanu PF in the UK has told the BBC President Robert Mugabe is still in charge, but the ruling party was being "realigned" as part of the army's actions. Zimbabwe's largest daily newspaper, The Herald, has published its first story since the military takeover. The article says the action "does not represent a military takeover". British citizens in the Zimbabwean capital, Harare, have been told to stay off the streets as the country's military said it had seized power from President Robert Mugabe. He called for calm and restraint, and expressed the hope that developments in Zimbabwe don't lead to unconstitutional changes of government, which would be contrary to the conditions of both the SADC and African Union. South Africa's President, Jacob Zuma, has urged the government of Zimbabwe and the Zimbabwe Defence Force to resolve the situation amicably. 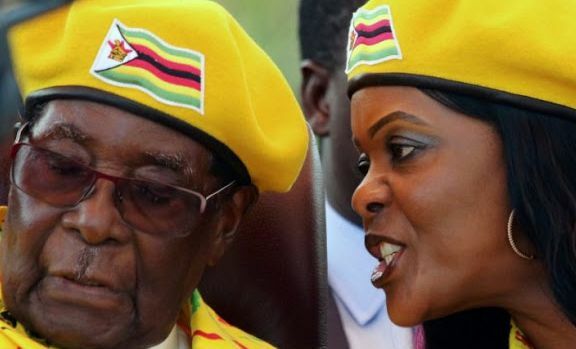 Zimbabwe's army: This isn't a coup Zimbabwe's army has said it has President Robert Mugabe and his wife in custody and is securing government offices and patrolling the capital's streets following a night of unrest that included a military takeover of the state broadcaster. The night's action triggered speculation of a coup, but the military's supporters praised it as a “bloodless correction”. China said on Zimbabwe military chief General Constantino Chiwenga's visit to the country last week was a normal military visit. The military just detained Zimbabwe's Finance minister Zimbabwe’s military have detained Finance Minister Ignatius Chombo after seizing power in an attempt to root out “criminals” around President Robert Mugabe who it said were causing social and economic suffering, a government source said. 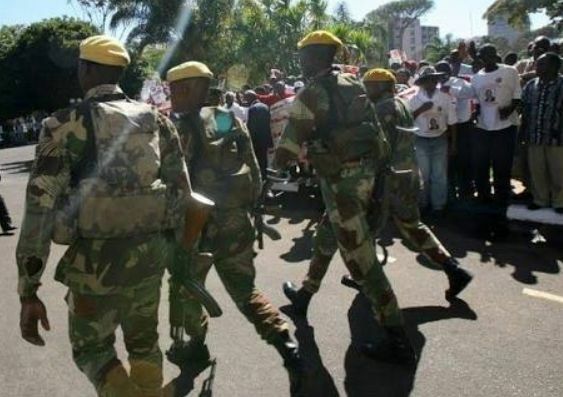 British nationals in Zimbabwe's capital Harare are being advised to stay indoors amid reports of “unusual military activity”. The Foreign and Commonwealth Office (FCO) issued the guidance in the early hours of Wednesday morning following political tensions in the African country. "We wish to make it abundantly clear that this is not a military takeover," Zimbabwe Major General SB Moyo, Chief of Staff Logistics, said on television. "We are only targeting criminals around [Mr Mugabe] who are committing crimes that are causing social and economic suffering in the country in order to bring them to justice. The army has been praised by the nation's war veterans for carrying out "a bloodless correction of gross abuse of power." The military will return Zimbabwe to "genuine democracy" and make the country a "modern model nation," Chris Mutsvangwa, chairman of the war veterans' association, told the Associated Press. The US Embassy closed to the public on Wednesday and encouraged citizens to shelter in place, citing "the ongoing political uncertainty through the night." The British Embassy issued a similar warning, citing "reports of unusual military activity."